"With a central location in the heart of St James’s, and an exceptional décor, The Balcon, is ideal for business and leisure guests alike. All-day dining restaurant, the Balcon offers a menu that reflects the Restaurant Chef’s love of fusion cooking while preserving elements of the French cuisine. As well as an appetising range of starters, main courses and desserts, the restaurant offers for dinner a mouth-watering seven course tasting menu." By sending this booking your details will only be sent to The Balcon and will never be shared with other third parties. By clicking this box you agree to the Terms and Conditions set out above. You can book to reserve an area of The Balcon for you and your friends. Just enter your requirements below to see what they have to offer. Sofitel London St James has recently launched Le Goûter for the children. While parents enjoy a delicious afternoon tea either in The Balcon or The Rose Lounge, children can now have fun with their tailor-made version of the afternoon tea. What did you think of The Balcon? I discovered the Balcon thanks to a friend staying at the hotel a few moths ago. As a French person, the Balcon serves what I can describe as DE-LI-CIOUS food. What I love about this restaurant is that it offers typical french food but also original meals... whether I bring my french family or english friends, it pleases everyone ! Top quality and very friendly service. The atmosphere is like a cosy parisian brasserie and the prices very affordable for the quality of the food served. My favourite French restaurant in London.... Great value for money and great location in St James next to parks, museums and theatres. Always bring friends and family after shopping or a show...... I recommend the small plates and charcuterie plate.... Always go for fish as a main, they have a nice selection.... And icing on the cake is the French pastries selection...... Difficult to resist!..... I have also tried on few occasions the Rose Lounge for afternoon tea with live music. No real atmosphere. I could never see me going there and being relaxed. The decor is amazing but you would always think you’re in a hotel. The food was good and a real quirky menu but not sure if the menu fits the surroundings. Not really my cup of tea as its expensive and I can't really see the occassion you'd be going there for. Historically, attempts to unify the two nations either side of the Channel haven't always been a particularly good idea. Here, however, the entente seems pretty cordial. 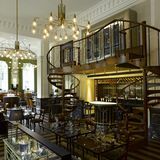 The Balcon sits within the Sofitel St. James, an upmarket hotel right on Pall Mall. 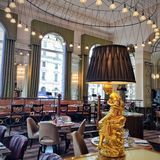 It's recently reopened after an extensive (and expensive) refurbishment from the Russell Sage Studio that's left the restaurant, lounge and charcuterie bar oozing glamour and style. 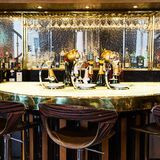 The dining room is dominated by the eponymous champagne balcony that surrounds a tasting station and an impressive fridge full of over 70 tempting varieties of fizz. 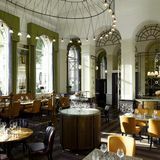 It all looks resplendent in its grand Parisian style - the double height ceilings, sculptural light fittings and high end furnishings lend the dining room an air of opulent grandeur, whilst the lounge is cleverly tucked away and feels like a chic London cocktail bar (with a French twist of course). Throw in a private dining space and a charcuterie bar, and The Balcon is well primed to host the great and the good for whatever tickles their fancy. The staff are enthusiastic, knowledgeable and professional, setting the tone for some happy dining. Sharing doors with a hotel has its pitfalls, and lesser schemes have come a cropper on the captive nature of their clientele, but the long walk to the bathroom is pretty much the sole reminder that this place calls the Sofitel St James its home. There's a nice balance between the buzz of Parisian bistro and the refined air of the English dining room, and it's one that feels a welcome world away from the hotel lobby that sits so nearby. Starters, salads, tarts, terrines and charcuterie sit atop a menu that blends influences effortlessly: a British classic of potted shrimp (£10.50), for example, is given a Gallic twist from a crustacean velouté (with a pike custard thrown in too, just for good measure). Charcuterie from Monmouthshire, Wales and Cantal sit cordially together, and a shared tasting plate is a good way to kick things off. The French meat is plentiful and exquisitely cured - the air dried ham and smoked duck breast particularly rich in flavour. A brioche toad in the hole (£9.75) is an interesting take on a staple, but it suffers slightly for its density - the cold pistachio infused sausage is well seasoned but the surrounding brioche loaf combines with it to leave things just a little stodgy. The selection of mains is equally generous, and pretty enticing too. Black bream (£20.50) with braised fennel, seaweed and beurre blanc is one of the simpler (and easier to trace) dishes - and is delicious for it. A deftly seasoned fillet is pan-fried to crisp-skinned perfection and served with elegant accompaniments for a very well balanced plate. Despite its promise, the Scottish beef and foie gras cottage pie (£23) with chanterelles falls foul of the best intentions of integration. The cottage pie is superb - the chanterelle mushrooms adding a woody edge to the rich gravy and fine beef mince - but the idea to lay three slices of cold, salted foie gras on top of the mashed potato should have remained just that. Desserts offer a more limited set of choices. A raspberry financier pays a very British homage to the building's earlier life, and a chocolate soufflé offers the best of refined French sweets. The latter is exceptional, with its accompanying pistachio ice cream providing a powerful and refreshing foil to what's essentially a pretty perfect pudding. Champagne dominates, and it's no surprise to see an impressive array of choices on the list - happily by the glass as well as the bottle. You get the impression that many will be drawn here merely by the promise of bubbles and a chat with the 'Champagne Angel' - sommelier, Christine. For those with less fizzy desires the wine list is no shrinking violet either - ordered by taste and structure rather than country, this is a list that leaps between grape, region and country in a surprisingly coherent manner. 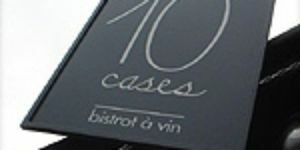 Pinots feature heavily on the red side and a fine mid-range example from the Cote D'Or region is delicate and thin, but with enough fruity robustness to complement the dueling culinary styles. Cocktails, high teas or even organic ales are all available too. There's no doubting that The Balcon's aim to bring the best of French and British dining works very well indeed. And if they could just ditch the couple of instances of Franglais, then it would probably be nigh on perfect.